Two Dresses All Along? How Do We Explain These White-Gold, Blue-Black Dresses On Reddit? Of course, if a person has a pulse, they’ve heard of “The Dress” controversy that had people seeing either a white/gold or blue/black dress, begun by two women, as reported by Business Insider ‎, named Sarah Weichel and Caitlin McNeill. They never planned for the dress photo to go viral and for their questions about the color of the famous dress to overtake the world — and launch plenty of science lessons about eyeball cones and perception and lighting and optical illusions and exposure and llamas and all the other stuff that dress launched. Once the original dress was discovered on Amazon’s U.K. site, the Roman Women’s Lace Detail Bodycon Dress Royal Blue product page that obviously shows a blue and black creation that’s garnering a ton of crazy comments — like one person who blames the dress for their trust issues — the matter seemed settled. That is, until this reddit post titled “Wait…” appeared, and linked to a photo of two women wearing that famous dress, with one being blue and black, the other being white and gold. 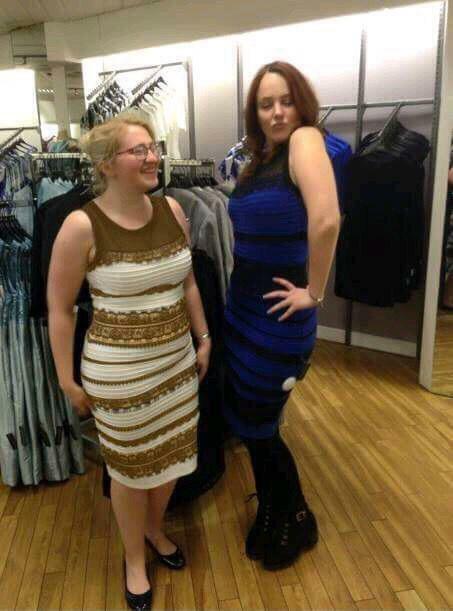 Conspiracy theorists went on high alert, asking through viral memes whether or not there were two dresses all along. A Google Image search to try and determine the source of that new gold/white, black/blue two dresses photo initially turned up foreign websites — one being Russian that Google Translate wouldn’t translate — as the source of the new two dresses photo. On Monday, the same Google Image search shows a number of places that have re-tweeted the new image, with interesting hashtags on Twitter, such as #plottwist and the like. As usual, the comments on reddit beneath the viral post are priceless, with some wondering if the above photo represents a blue and black dress that was bleached out on the left, or some other strange phenomena. Between all the buzz over the blue/black, white/gold dress over the past week, along with Lupita Nyong’o Oscar dress by Calvin Klein that contained 6,000 pearls, as reported by the Inquisitr — one that was stolen then mysteriously returned — dresses sure have had their fair share of media coverage.